Volunteer vacations are the way of the future. A volunteer travel experience can offer your family the opportunity to dig deeper, expose new ways of life, and stretch the boundaries of what is ordinary and familiar. With busy schedules and hectic lifestyles, it’s not always easy for us parents to have important conversations and share our deepest values with our kids. A volunteer travel experience can offer your family the opportunity to dig deeper, expose new ways of life, and stretch the boundaries of what is ordinary and familiar. By immersing in a diverse culture and working side by side with a community, your clan can see the world through new eyes. Further, you’ll strengthen family ties while creating lasting, shared memories. A volunteer adventure is a concrete way to share ideas about your family values with each other, as well as form a team within a team. By traveling as a family, you bond over shared challenges and accomplishments. As one parent who took the leap observed, “The closeness you sense with your child is enriched many times over because you have this difficult and amazing experience together.” When children participate in philanthropic trips, their world view is broadened as they are shown a reality outside of their own. While it often seems impossible to get away, investing in your family has incredible returns. Going on a volunteer trip— be it local or international— facilitates the opportunity to move beyond self, family, city, and nation to the world at large. It is a hands-on approach to teaching compassion, respect, cross-cultural understanding, and global responsibility to children. It’s also a chance to practice life skills, such as self-efficacy and patience. I had the opportunity to volunteer with my family. When my daughter Ananda was just 6 years old, we went to Mexico. I had hoped for three things. First, to share with her my belief that giving back isn’t a privilege, but rather a way of life. Second, to bring her into my work of responsible cultural exchanges. And third, to experience firsthand the world that does not live as we do. Ananda in turn taught me to have unconditional compassion for others. An overwhelming sense of belonging came over me as I watched Ananda play hide-and-seek with the Nahua children. It truly was a great reminder of our shared humanity and the “oneness” that binds us all. 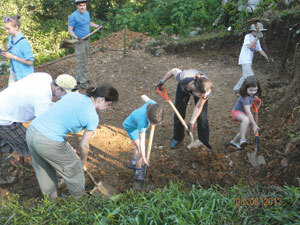 Volunteer family vacations are growing in popularity. Companies such as Global Citizens Network are experienced in choosing communities that are particularly welcoming to children, including international sites in Ecuador, India, Mexico, and Tanzania, as well as domestic sites, such as Minnesota and Washington. While you’re on a trip, you’ll be working with the community on a project of the community’s choice and direction. Depending on their ages and abilities, your children might help by painting, raking gravel, or hauling water. In past trips, youth participants have chosen to play with the kids from the host community. The program length varies from seven days to more than two weeks. Accommodations at sites are often modest; some sites have indoor facilities, while others are outdoors. Sometimes families live with a host family or with the team in a communal building. Volunteer travel with your family can be rewarding, as well as challenging. Dealing with the unfamiliar and unexpected can be difficult, especially with children. Look to team leaders to provide support in picking a destination and preparing you and your children for the trip. If your family likes adventure and is looking for a meaningful trip that creates lasting bonds from unique experiences, discover the difference that can be made through volunteer travel.